Orkla Real Estate focuses primarily on real estate development, in addition to some property management. Orkla made its first property acquisition back in 1941 when it purchased the building at Klingenberggt. 4. Since then, Orkla Real Estate has been active in real estate investment and development. 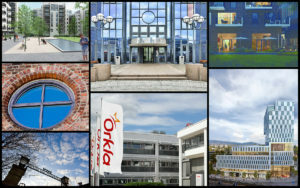 Orkla Real Estate and its associates and business partners jointly develop residential, office, commercial and hotel properties. Orkla Real Estate has been through several stages of buying, selling and redeveloping properties since the beginning in 1941. In 1991, most of Orkla Real Estate’s property portfolio was acquired by Eiendomsspar, but just two years later, in 1993, Orkla once again invested heavily in property development when it acquired Skøyen Business Park. Orkla Real Estate’s largest development projects in the past was building Ringnes Park and Idun Industri Eiendom, where a total of almost 100,000 m2 of residential and non-residential space is to be developed in cooperation with Macama Invest AS. Today Orkla Real Estate`s largest projects are construction of the head quarter for Orkla ASA, apartments at Sofienlunden, and transforming the Orkla Brands headquarter into approx 140 apartments at Sandakerveien 56 in Oslo.